The AMS Performance Upgraded Oil Cooler Kit provides the most efficient oil cooling available. With an additional 14 rows of heat exchange and 30% increased surface area over the stock unit this is the ultimate oil cooler for your vehicle. Using one of the most efficient heat exchangers on the market, road racers, drag racers and performance street cars alike can be confident that oil cooling will not be an issue. We suggest the replacement of the factory oil cooler after any engine failure to prevent contamination of your new engine. 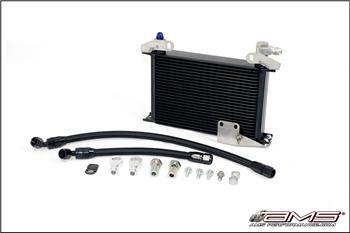 Our kit not only out performs the factory cooler but is a cost effective alternative to the expensive OEM unit.